When I went on my ‘One to One’ with Paul Gallagher in the Lake District back in February I was keen to find out more about digital printing. 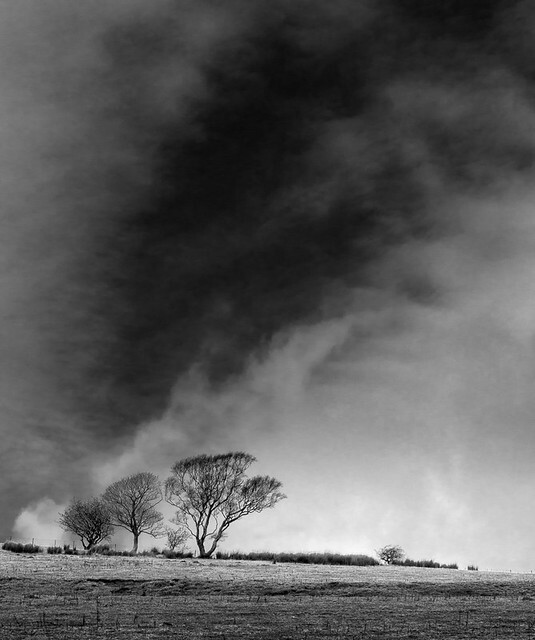 A dark art in photography circles but an absolutely essential skill to learn and understand to produce a well made image on paper. I really take pleasure in printing my photographs. Yes it can be expensive with printer cartridges costing an arm and a leg but there is nothing quite like seeing a printed photo, mounted, framed and hanging on the wall for others to see. The photo paper is not cheap either, particularly if you choose a ‘fine art’ paper. There is also a huge choice from gloss to matt, from a smooth finish to a textured one and so the list goes on. The weight or thickness can also vary and is another factor when choosing the right paper. Different images or styles of photography also suit different papers so it can really get quite complicated. Until today I have almost exclusively been using Ilford Galerie smooth pearl. A 290gsm paper with a lustre finish. My printer, a Canon Pixma Pro 9000 MkII is an excellent printer; it can print up to A3+, but it has one major problem as far as I am concerned. It only has one black ink cartridge and as I almost exclusively print in black and white it cannot produce the quality of print I would like. The reason why this is the case is that in order to print the full range of tones, it simply lays down less black ink to reproduce all the mid tones. Consequently the ink coverage is not as great, which can sometimes lead to a ‘blotchy’ appearance. The other issue I had with the Canon was that I couldn’t produce a true black and white print, probably because of the single black ink or possibly a driver issue. It always had a slight, almost sepia colour cast. It was fine until you held it against the Epson print using the same paper. There really was quite a difference. If I was going to continue my passion for black and white, then I wanted black and white prints, not something which was very good but in all honesty was second best. In a desire to improve the quality of my printed work I was naturally interested to see what printer and paper Paul Gallagher used. When I arrived at his studio it didn’t take me long to discover that he used an Epson Stylus Pro 3880 and Epson Traditional Photo Paper. I had already read a number of good reviews of this particular printer. It uses four separate inks cartridges to print a black and white image. Photo black, matt black, light black and lastly light, light black. They are 80ml cartridges, so although expensive to purchase initially they work out much cheaper per print than say my existing printer, plus you don’t need to replace them so often. As well as being able to print on A2 size paper, it also has a dedicated driver for monochrome printing called Advanced Black and White or ABW for short. After Paul and I printed a few images using this printer and the ABW settings, I was convinced that if I wanted to take my work to the next level then an upgrade to the Epson 3880 was going to be desirable. So here we are a few months later and the Epson 3880 is out of its box, set up in my home and a few test prints later and all I can say is – ‘what a printer, it’s fantastic!’ Easy to install, I was printing my first images in no time at all, with I think great results. Although I like the Ilford Smooth Pearl paper I was keen to try others, so I bought a couple of test packs from Fotospeed and I started printing. I wanted to ensure I used the same settings for every type of paper, so by way of a record here they are. 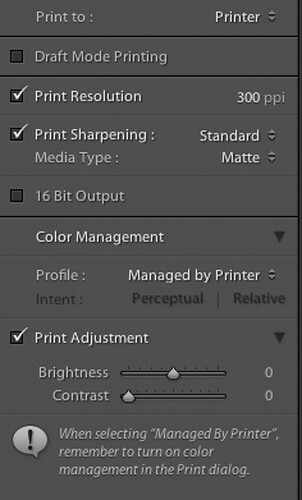 The first screen grab is taken from the print settings tab in Lightroom 4. It is of course possible to use Photoshop for printing but I have always found Lightroom an easier program for this purpose. Although I have installed ICC print profiles from Fotospeed these are not required as the Epson driver manages the whole process really well. 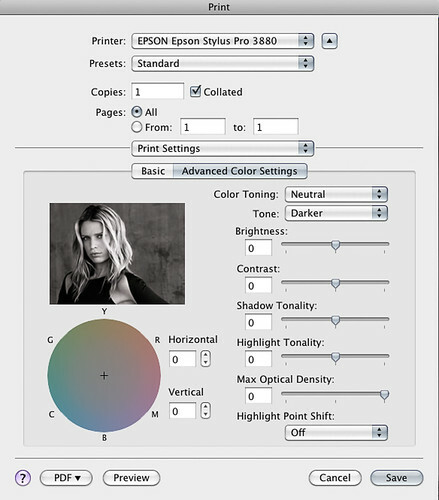 Click on ‘print’ in Lightroom and the Epson window opens. 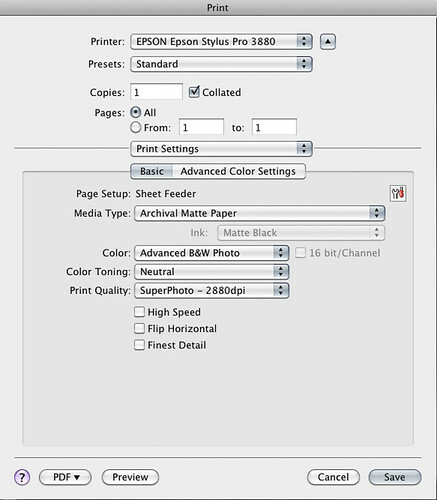 The screen grab below shows the ‘basic’ print settings. Click on ‘Advanced colour settings’ and it opens another window specifically for black and white printing. Here are the settings I chose for the test run of different Fotospeed papers. The preview image gives an indication as to how the image will print if any of the settings are changed. I chose three matt papers for this initial test to see how they would compare with the Epson Traditional Photo paper used by Paul on his 3880. Firstly Platinum Matt (280gsm), secondly High White Smooth (315gsm) and lastly Natural Smooth Textured Bright White (315gsm). There are others but I wanted to start with these. My first impressions of printing on a Matt paper was very good. In my view they retain excellent tones and detail but do not have the distraction of the ‘lustre’ finish which has a slightly reflective sheen. I don’t think the matt paper will work for every image but for this particular landscape I was delighted with the results. Of the three papares I did not warm to the High white smooth paper. Despite its name the paper has a ‘cream or yellow’ tint which is particularly noticeable in the lighter areas of the image. This comment does not apply to the other two papers. Both the Platinum Matt and NTS Bright White produce excellent ‘whites and blacks’, the main difference being a little more texture in the NTS Bright White, together with the fact that its a slightly thicker paper – 315gsm against 280gsm. There is of course the question of price. For 25 sheets of A3+ paper the Platinum Matt works out at £2.00 per sheet whereas the NTS Bright White is £2.40 per sheet. Both papers are 100% acid free and have an image life of 85 years. I will test some more papers as I would like to find two or maybe three fine art papers that would suit the work I am likely to produce in the months ahead. But for now all I can say is how happy I am with the print quality of the Epson 3880 and the ease with which I have been able to print something which is more than acceptable to me.